Got a favorite sport? Want to remember a top play? Looking for more info on your favorite athlete? You'll find all that you need in this awesome book, now in full color for the first time ever! From the kickoff of the NFL and college football seasons to the final roars of the NASCAR circuit, from the NBA tipoff to the Final Four, plus soccer, golf, tennis, hockey, and much, much more: This is your one-stop shopping spot for all things sports. Not only does the book look back at the heroes of the past year, you can preview the top players and events of the coming year, so you won't miss a play! 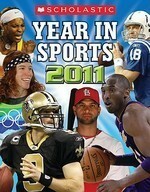 Make sure and pick up the Scholastic Year in Sports 2010 at your bookstore or Scholastic Book Fair! This awesome title was co-written by James Buckley Jr. and Jim Gigliotti, with help from other sports experts, and was produced by the Shoreline Publishing Group.